This week has seen the seedy side of the internet surface. Social media has lead us to a couple of websites that are stealing pictures of young girls and displaying them online. Kind of like those male entertainment sites; except this time using underaged girls. There is no specific mention of those sites because I’m sure they fall under some definition of pedophilia. Malaysian legislature doesn’t cover personal privacy; and neither does the common law (or at least the state of the common law is still uncertain). The recent implemented Personal Data Protection Act 2013 doesn’t protect private individuals against other individuals. But that’s not the point here, governments across the world are usually too slow to deal with the changes wrought by the internet. Which means that anyone who wants to remain safe on the internet should take matters into their own hands. Here’s what you can do to remain anonymous, or at least private. Set all profiles to private. Social media has this odd thing where it wants you to share everything with the world. This is great if you are a public figure or brand. It’s part of making a living. A regular person doing the same thing becomes more of a walking target. Parents should at least ensure their children’s profiles are set to private. In Facebook, Twitter and Instagram, put the options in the top right corner of the screen. Under the gear icon, and privacy settings. 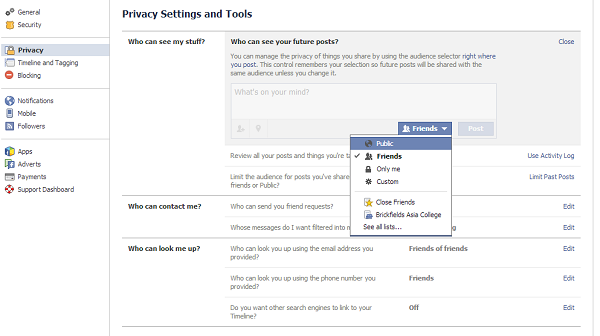 Most of the privacy settings are quite intuitive, even if they are generally set to public by default. Tagging friends is often used to get their attention for important things; or things people think are important. Here is the thing, tagging people also increases the number of people who can see the post. This matter when pictures are involved. 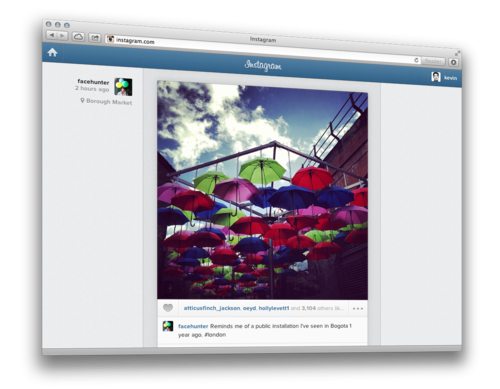 Most social media offers the option to at least approve tags before they go live. This option should always be turned on. Geotagging is the inclusion of location data in everything you do. This matters on the internet because anyone can look up the meta-data of a post (or the EXIF data on a picture) and figure out where it came from. Essentially, people will be able to figure out where you live from your pictures. Ensure this is always turned off. You should also note that smartphones tend to include geotags when you post to social media. If you want to be extra careful, you should turn off location services on your phone. Although this may have the issue of preventing certain apps from working. Do not add anyone you don’t know to your circles. This one is similar to those ‘don’t talk to strangers’ PSAs from the 80s and 90s. It’s impossible to avoid all strangers on the internet, but think of your social media profile as your home; you wouldn’t let just about anyone in. Which is why making friends over the internet should be treated with the same care and caution as disarming a rather large bomb. One wrong move might not just expose you do danger, but also everyone in your contacts list. Many photographs and a large amount of personal information is stolen through hacking. More often than not, this is due to the weakness of the passwords people use. Really, ‘123456’ is not a secure password. Neither is password. A proper password might be a little harder to remember, but it will be worth it. 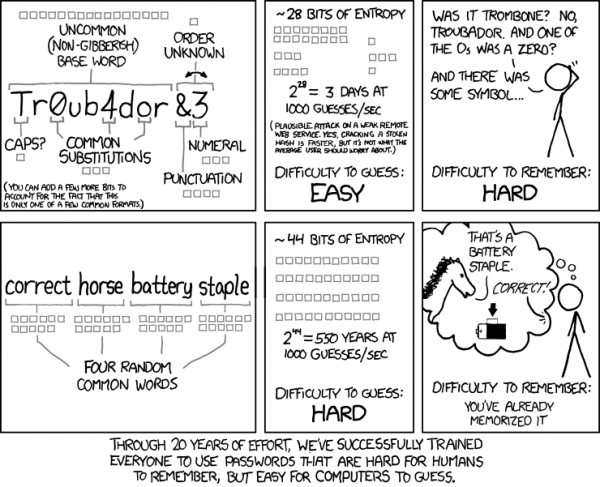 This XKCD comic demonstrates how to come up with a password that is both easy to remember and reasonably secure. Some websites require more than just a password to access. The extra key usually comes in the form of an extra password that is randomly generated and transmitted only when needed. This makes the login process a little more complicated, but the extra security is worth it. Google has a solid two stage authentication process in place, which is a good place to start. If anything, this Wired story from Matt Honan should explain the necessity of an extra layer of protection. This should go without saying. However, the internet has a habit of making people do stupid things. Anyone who read our story about sharing too much on the internet will know just how much anyone can find out about you from the internet. The less personal information out there, the safer you will be. Just remember, it’s not just social media where this matters; but anywhere on the internet. Also, watch the video to learn just how much we share without realising it. We like to think of the internet as a free space. One of the only places where we can fully express ourselves due to the almost complete lack of governmental oversight. But that also means that we are left to our own devices when something happens. So please, before you do anything, no matter how harmless it may seem, take a moment to consider who might see it.